Do your employees have a social media checklist before take-off? Climb aboard this week’s episode as we discuss 4 important guidelines–and one bonus one! American Airlines’ internal memo to employees about social media guidelines gets leaked to the Chicago Business Journal. Andy Beal: Thank you for joining us. We’ve got a good show this week. We’re going to discuss a leaked memo, if you can believe. Those are pretty popular these days, but this one is from American Airlines. It was sent out to their employees with their new social media guidelines. Andy Beal: And Chicago Business Journal obtained a copy of it. We don’t know if this is one that they were just fed, or if they actually did get somebody to leak it to them, and now it’s something that’s public that shouldn’t have been. But we wanted to go through it with you, because it’s actually kind of interesting. I’ve always been a big fan of just having simple social media guidelines as opposed to a massive social media handbook with lots of detail and lots of pages. Andy Beal: And American Airlines, they’re pretty vocal, they’re pretty active on social media. So I thought they did a pretty good job, so we’re gonna go through it, and we’re gonna start off with the first point that they made. They made four points, and the first one is, to be transparent. Andy Beal: And by that, they’re referring to people on social media basically disclosing that they are an actual employee. And I think that’s pretty good, especially if you don’t actually say anything on your profile that you’re an employee of a particular company. But then, chime in on a conversation about that particular company. Andy Beal: You really need to let people know, Erin, don’t you, that hey, I’m talking about this, but I’m also an employee of this company. Erin Jones: Absolutely. And I agree, I mean, it’s no secret for anyone that listens fairly regularly that we absolutely push transparency in pretty much every aspect of running a business, whether it be online or in person. But I think it’s good. You see people kind of on social media, pumping up a company and not saying that they’re a representative of that company, and you always give pause and go, you know, do these people really love this brand this much, or are they kind of under cover working for them? Erin Jones: So I think this is good for both sides, both for the company and for the employee. Andy Beal: Yeah, and I think it’s important that you don’t then go ahead and make up stuff that you think you know and trying to convince the person that’s somebody in authority, when perhaps you’re not. You know, if you’re gonna chime in, then you need to do so, keep in mind, what is your status of the company? What is it you do for them? And then, how much do you actually know? Andy Beal: Because if you don’t know the answer to the question they have, it’s probably a good idea not to try and give them one if you’re not giving them that you actually know fully well what the actual answer is, but maybe just demonstrate that you’re willing to go to the leaders of your company and ask them to respond, and almost be an intermediary for the people that are complaining. Erin Jones: Definitely, especially with an airline. You know, somebody saying that something is absolute could get them or the customer in a lot of trouble down the line, whether it be with logistics, or rules at the airport, and whatnot. Erin Jones: And you know, as a customer and as a representative for companies, I am really comfortable with someone saying, you know what? That’s a great question, let me find out and get back to you. It’s better than dead air, and it’s honest and direct, and I think that it makes the company more human, which is another thing that we talk about a lot here. Andy Beal: Right, and if we’re talking about the whole be transparent, then if you’re gonna do that for somebody, tell them how long it’s gonna take to track that down and say, well, I need to speak to the VP of x, y, z, he’s in a meeting right now. I should hopefully get to speak to him in the next 30 minutes, and then remember that if that timeline goes by and you’ve not got back to them, chime in and just say, hey still waiting to hear, might be another 20 minutes or so, soon as I hear, I’ll keep you updates. Andy Beal: Because a lot of companies, they post too many things that are like, we’re investigating this and as soon as we know we’ll get back to you, but they don’t give you a timeline, and then when hours go by, they’ve not done anything to update you, they’re still actively working on it. Erin Jones: Right, and it prevents the customer from coming back in 15 minutes when you know that it’s gonna take you three hours, so it prevents some of that back and forth that may not need to happen. Andy Beal: All right, so the next point is that they said to be respectful, and by that they’re basically reminding you to be respectful of your social media actions, and quote, unquote, they may reflect on our company and your fellow team members, and they say that you should treat others with respect and dignity. Erin Jones: I like that, and I like that they also said it’s okay to share your opinions, but do so in a way that treats others with respect and dignity. So they’re not saying dilute who you are, or don’t be yourself, but just remember that you are dealing with a customer here, and you are a representative of our brand, so be kind. Erin Jones: You know, and that’s kind of the lesson that I feel like everybody could take away from. Andy Beal: Yeah, absolutely. Show compassion to any customer that’s facing an issue, or even if you don’t know all the facts, just kind of, basically think about being in their shoes, and so be respectful and show compassion. Another thing I would say is, just because you see that there is a complaint going on or an argument going on about a particular company issue, and you work for that company, don’t feel like you have to dive into that argument or that discussion if it’s not your normal role to do that. Andy Beal: Because, that may not be something that is helpful for the company, and it may be something that gets you into a lot of hot water. Now, that is completely different if somebody approaches you because they know you work for the company, so even if it’s not your responsibility, but a friend, an associate, or just somebody searching social media, sees that you work for the company, and they approach you, then you still need to be part of that conversation and obviously show respect and compassion. Erin Jones: Absolutely. You know, we’ve, again, talked a lot about how people don’t just clock out at five o’clock anymore. If you’re being a representative for your brand, you’re kind of always that representative for your brand. So, if somebody does approach you with a question, even if you can’t answer it, directing them to the right place to find the answer, or just taking a minute to try and help them out, really goes a long way both in their opinion of you as a person and in their opinion of the company. Andy Beal: That will go a long way to you getting recognition from your company for helping out. Erin Jones: Absolutely. And, not only that, I’m gonna get a little bit woo-y for a second, but, that promotion of good will is contagious. So, you know, you’re putting that good out there and that positive energy out there, and you never know where it’s gonna take it. Instead of ruining someone’s day or making them frustrated, you’re uplifting them, so what bad is gonna come from that? Andy Beal: I always say that you should absolutely assume that someone that’s complaining is probably having the worst day of their life, and maybe even overreacting. Because I’ve seen it first hand where I’ve had people contact me, and they seem really gruff and they’re making accusations that are not true, not substantiated, couldn’t possibly happen, and instead of getting really defensive, I get really compassionate and try to really help and find out that they just got fired yesterday, or they’ve got a child in hospital, and they’re just having a really rough time. Andy Beal: So, now, it’s just always a good idea to assume that somebody that’s complaining to you has got other things going on, perhaps having the worst day of their life, and don’t get ultra defensive right away. Just show that you’re a company that cares, and you wanna get to the bottom of this, you wanna ask questions, you wanna find out what the issue is, and then you work hard to either help them or maybe explain the situation that’s not something technically true. Andy Beal: But yeah, just assume they’re having a rough day, and maybe you’ll turn it around for them and they’ll become your biggest advocate. Erin Jones: And you know, I have found that people that do start out the most frustrated, if I can turn them around, usually end up being the biggest evangelists for the company. You know, if they’re not afraid to make noise when they’re unhappy, they’re probably likely to also make noise if you make their day. Andy Beal: Absolutely. You bang on a drum wrong, it’s gonna make a loud noise. You bang on a drum really well, it’s gonna make a beautiful loud noise. But it’s gonna make a loud noise, either way. You’re absolutely right, Erin. Those that kind of take the time to be vocal on social media because they’re unhappy, pretty good chance that if you make them really happy and you do so ’cause you’re looking at this and saying, okay these people are really active on social media and they’re really loud, I’m gonna assume that, that will continue to the case. Andy Beal: So I’m gonna go over and above to make them happy, and make sure that this is not only resolved but maybe I put in a little bit of incentive or compensation, then you’re absolutely right. Guess what. That person may turn into a really loud, beautiful sound that says nothing but good things about your brand. Andy Beal: So, you know, they just don’t want you to just dish information. They don’t want you to talk behind the company’s back, they don’t want you to share secrets. We still don’t know whether they want you to leak memos or not, or otherwise this information wouldn’t get out there, but they just want you to be responsible. Andy Beal: And I say that when you are an employee of the company, act like you have ownership in that company. Now, that ownership may not be stock, it may not be any kind of interest in it financially, but you may have sweat equity in the company, because your actions all add up to the success or failure of the company, and so, if you act responsibly, as American Airlines is suggesting, and be guarded, don’t give away informations not public, just always act like you’re the CEO and say, okay, with this help the company or would this hurt us if I revealed this? Erin Jones: Agreed. And, you know, this makes me think of a training that you did actually a long time ago in competitive intelligence. You know, people are really unaware of what little tidbits they give out can add up to a whole lot of information when put together, so I found this one really interesting, because I think that this is definitely a balancing act. Erin Jones: And you know, obviously they don’t want anybody giving away big secrets, but then there may be little things too, that people wanna be careful, a bit more discreet about. Andy Beal: Yeah, and be the eyes and ears of the company. You don’t have to be the mouthpiece, you don’t have to be vocal. But if you’re on social media, you can watch what’s being shared, you can listen to what’s being discussed, and if you see something that’s being leaked, something confidential that’s being discussed, you don’t have to be the one that chimes in, you don’t have to be the one that speaks up. Andy Beal: You can be the one that goes to the appropriate person in your company, whether that’s a small business and you’re going straight to the owner, or whether that’s a 14500 company, and you’re going to someone in, you know, the communications department or the legal department, wherever it may be, and just say, hey, I came across this tweet, or I know we’re not really active on Instagram, but I saw this screenshot share, you guys may wanna know about it because it’s something we may want to take action on. Andy Beal: So you can be responsible in a way that helps the company without you actually having to be so active on that social media channel. You can just be the eyes and ears. Erin Jones: Absolutely, and that kind of information can be invaluable. You know, if that’s a channel that’s not being monitored, you could make a huge difference for your company. Andy Beal: Yeah, you can, there’s lots of examples that are out there of individuals that are not necessarily major stars, but they can do something that’s a big help to that company. All right, so number four, they suggest this is kind of an also ran. I was just reading the article, I don’t know if this is an official part, but they also suggested that your as an employee of the company should be aware. Andy Beal: So that means it’s a reminder that anyone can see your posts, including the media. So they just want you to know that anything you talk about online could be watched. That goes for your personal posts, too, so even if they’re unrelated to the company, they could still reflect badly on the company. Andy Beal: Now, they could reflect positively, too, but the concern here is that you post a photo of you playing beer pong and completely drunk, or maybe at some kind of political rally that goes against what your company stands for, whatever it may be, rightly or wrongly, they want you just to be aware that your posts can be shared and seen by customers, shareholders, members of the media, and bloggers. Just about everybody. Erin Jones: Absolutely, and this one is the only point that I had a little bit of disagreement on. Part of the policy mentioned that they should utilize their privacy settings to determine how much information is accessible to the public, I would caution people to never assume that anything is not available to the public. Andy Beal: Oh, right, absolutely. Erin Jones: We see countless, time and time again, well I thought it was private, it was a private email. No, nothing is private on the internet. You should always assume that, that information is public and that it can get out there, even if you’re joking, someone might take your tone incorrectly. Erin Jones: I saw a thing online that said, like, dance like no one is watching but email like it may be read aloud in a deposition. Erin Jones: You know, you just don’t know. So I would really caution people to make sure that they’re not putting anything out there that they don’t want as part of their public image, let alone their company’s public image. Andy Beal: Yeah, but I would say that considering all the video channels that are out there, you should probably also dance like somebody is gonna watch you at some point. I mean, this is why you don’t find me dancing, because I can’t dance and there are plenty of Smartphones out there now that could capture that horrific attempt at dancing. I look like the polio dynamite when I dance. Erin Jones: You know, I met up with a friend a couple days ago from high school and we were joking about how lucky we are that social media wasn’t really a thing in the 90s because we might not have the jobs that we have today if it had been. Andy Beal: Oh, absolutely, yeah. I mean, we are very blessed that people weren’t able to pull out a video camera and take video and then post it within seconds, because that would’ve been bad for a lot of us. But I’m always of the belief that you know, this is something that causes chaos now, but in a few years, as the years go on, and we’re already seeing it. Andy Beal: Things that initially were something bad for someone’s reputation, they’ve become diluted, people have become numb to it, because they see them over and over again. So, even, example, I just threw one out there a few minutes ago, like a photo of you at a beer pong game. Andy Beal: Well, five, six, 10 years ago, that might’ve caused some issues, but now, people would be like, well, did you win? You know, which company lets you play beer pong? That sounds awesome. So, you know, our perspective has changed, our perception has changed, and that will continue to happen, because as technology becomes more readily available and we’re sharing stuff online, we don’t become as outraged or surprised when we see something posted, because we’ve just become used to it, because Twitter and Facebook, for the most part, they actively encourage it, a lot of times. Erin Jones: I agree, and they’re everywhere now. Like you said, you can’t really dance like nobody’s watching anymore, because someone is always watching. Andy Beal: And that leads me to our last point. So, Erin and I kind of gave this some thought about, well, what else would we add to these guidelines? And I would add that you should be yourself. So, your personality is part of a larger [inaudible 00:18:00] of the company’s personality. Andy Beal: So, let it shine, let it be out there. Part of the reason why I don’t like comprehensive social media policies and handbooks, is because it can turn you into a robot. It turns you into this conditioned person that has certain things they can say, certain things they cannot say, how to act, and it turns you into this autonomous robot that’s just like everybody else in the company. Andy Beal: And so, a company’s reputation hinges on who they hire, how hard they work, how well they treat a customer, whether it’s online or offline. So, let your personality be, let it shine, not only let the public and the customers see who you are and what value you’re creating, but let your employer see it, too. Andy Beal: So that’s my additional, what di you have Erin? Erin Jones: I agree, mine was similar, it was use good judgment. And I’m advising that both on the employee side and on the employer side. I think that if American takes the time to hire good people, make them way to be good representatives of the brand and let them know that they’re appreciated, then those employees are going to go out of their way to make the company good look in return, because they do have a stake in the company, whether it be their paycheck, their benefits, or their future employment. Erin Jones: So I think it has to go both ways for it to work well. Andy Beal: Yeah, I agree. And now, hopefully these guidelines, these just four simple guidelines with a few comments, hopefully that is the result of the fact that American Airlines is, highest people with personality and highest people with drive, and that are helpful, and that contribute to the reputation of the company. Andy Beal: So, that they don’t have to have a whole ton of policies, ’cause they’re not hiring rebels or people that are gonna be vocal and different and against the policies and the personality that American Airlines is building. Erin Jones: Definitely, and before long, they’ll have a reputation for having, you know, great friendly employees, that go out of their way to help out. Andy Beal: Absolutely. And, kudos to American Airlines, you know. We often have stories about airlines that are not positive in any way, but good job for them to send this out to their employees, whether or not it was intentionally leaked or not, it made it to the media, and we’re excited about a company that’s doing this kind of stuff, and hopefully that’ll help American Airlines to build a good reputation, and maybe they’ll then have a story that shows up in social media that’s not delayed flights or missing baggage, or pets that aren’t in health, or passengers in some airlines dragged and beaten. Andy Beal: So hopefully this is good for American Airline, [inaudible 00:20:51]. Erin Jones: I’m rooting for them. It is time for an airline to come out on top. Andy Beal: There you go. Well, we’ll end it there. We’d love to get your feedback, you can go to our Facebook page, Andy Beal ORM, or you can go to andybeal.com, and just leave a comment on the relevant post for this podcast. If you have any questions, or if there’s a topic you’d like us to cover, then we’d love to hear from you about that as well. Andy Beal: Erin, thank you for chiming in and adding a lot of valuable contribution to this story. Erin Jones: Thank you so much for having me. Andy Beal: And thank you guys for listening, we hope you’ve enjoyed it, and you’ll tune in again, next time. Thanks a lot, and bye-bye. 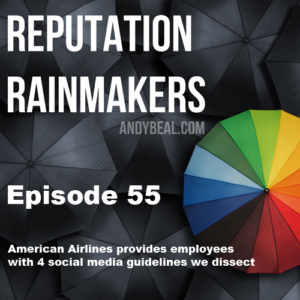 Share the post "#55 – American Airlines provides employees with 4 social media guidelines we dissect"